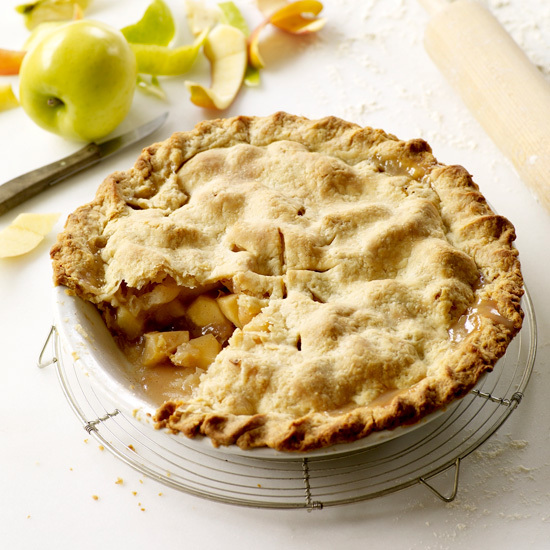 The best apple pies are usually made with a mixture of apples, because each type adds different textures and flavors. The best apple pies are usually made with a mixture of apples, because each type adds different textures and flavors. The choices, however, ultimately come down to personal preference. The only apple not to use is Red Delicious, which will yield a mushy, flavorless pie. Here are seven apple varieties to try. A sweeter, softer apple, compared with the popular Granny Smith, but it still holds its shape nicely when cooked. This sweet supermarket apple becomes even more flavorful when baked, and softens nicely without becoming mushy. For some, this is the ideal pie apple, but it’s also delicious mixed with tarter apples, like Winesap. These widely available tart apples hold their shape and give the filling a lovely tang. Since they’re so firm, blend them with other apples. This is a great sweet-tart pie apple beloved on the West Coast. These fruity-tart apples add complexity to pies. With a nice sweet-tart balance of flavors, these apples are great in the mix for pie. This heirloom variety of apple is tart, but softer than a Granny Smith. It’s a great addition if you prefer a less-sweet filling.